Holiday baking is one of my favorite activities every year! Is it yours? Because not only is it an excuse to bake wonderful goodies for others, but it’s also an excuse to “taste-test” everything you create. You’re with me here, right? 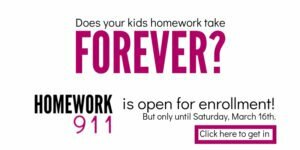 My kids love baking as well. Well, I should say they love decorating. 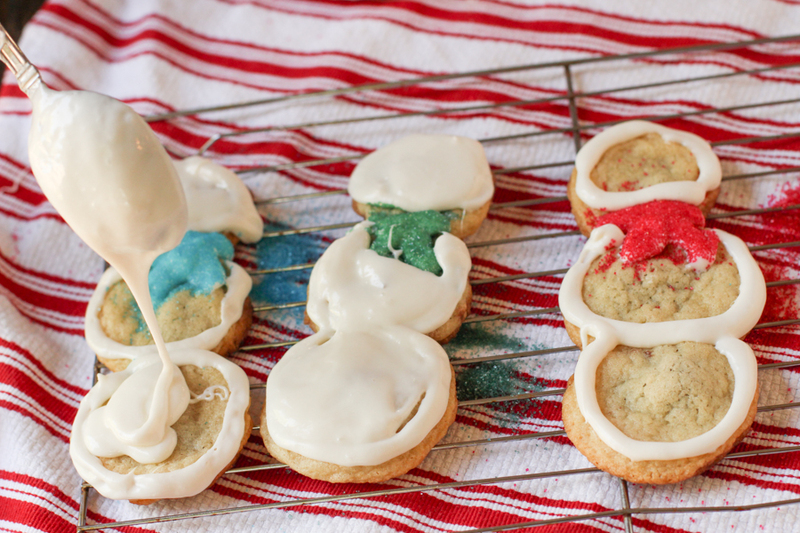 When making these sugar cookies, my son and daughter asked me 10.000 times..
After the first batch was ready, my son took over the decorating duties for a few of the cookies that didn’t work out from my various experiments. Experimentation in baking has delicious rewards! It was when he reached into the bowl of marshmallow frosting, scooped two fingers in and popped them into his mouth did I finally cut him off. But oh… these cookies are amazeballs. You’re hit with chocolate hazelnut deliciousness. Instant bite of heaven! Before you even begin, make sure you refrigerate the chocolate hazelnut spread overnight. It will make it much easier to work with. 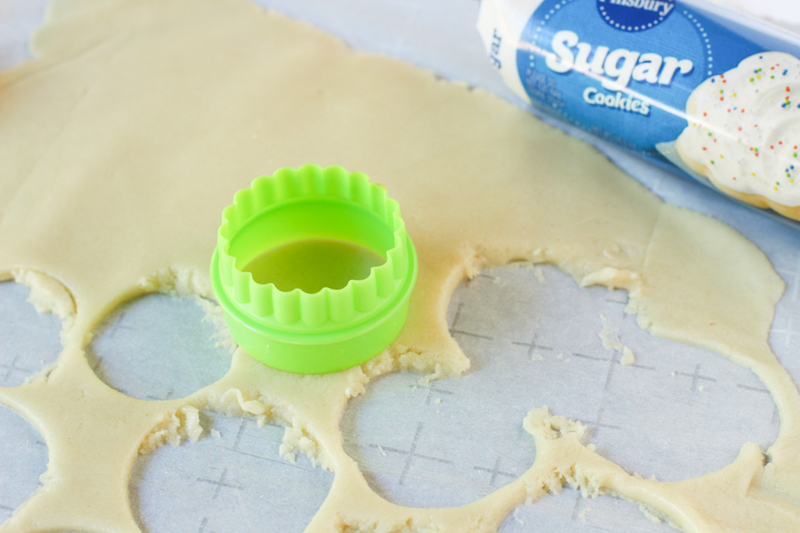 Now, open your tube of Pillsbury™ sugar cookie dough and roll it out flat between 1/4″ and 1/2″ thickness. I do this between two pieces of parchment paper so that the dough stays off the roller. Cut out three circles for each snowman. I used a 5-inch cookie cutter for the snowman’s head and a 5 1/2-inch cookie cutter for the torso and bottom. Scoop out a level 1/2 tsp of chilled chocolate hazelnut spread into the middle of each circle. Roll them into a ball and place about a half-inch apart. Place into a freezer and chill for at least 30 minutes. 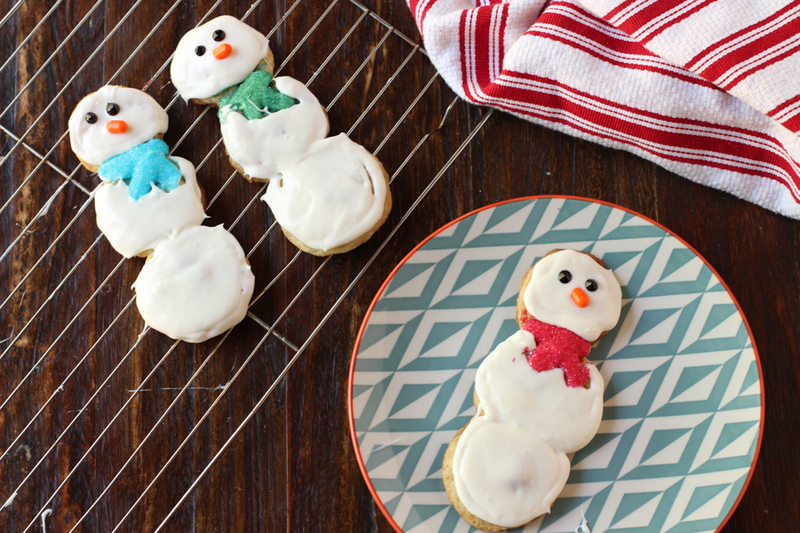 Now, bake those sugar cookies for 11-14 minutes until the edges of the snowman are golden brown and then let cool on a wire rack before frosting. 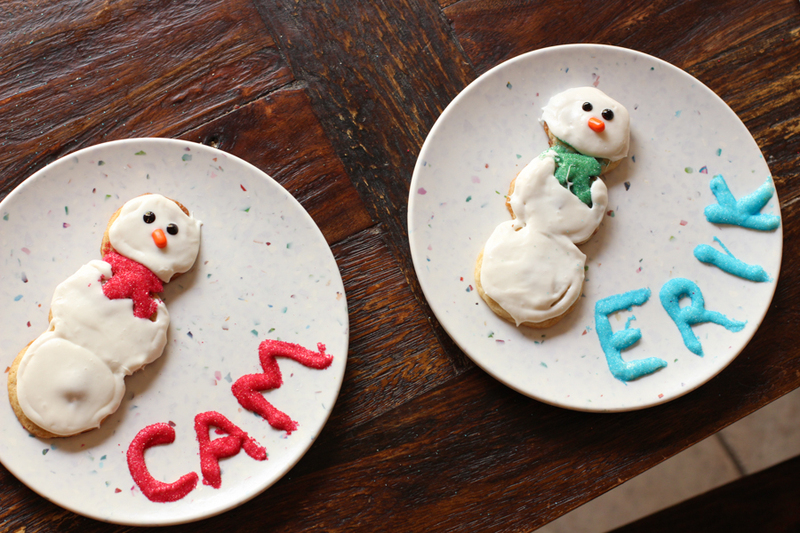 Since all cute snowmen need a scarf, we’re going to create ours first. Scoop frosting into a resealable plastic bag and cut off the tip. Pipe a scarf onto each snowman and sprinkle with candy sprinkles or colored sugar. 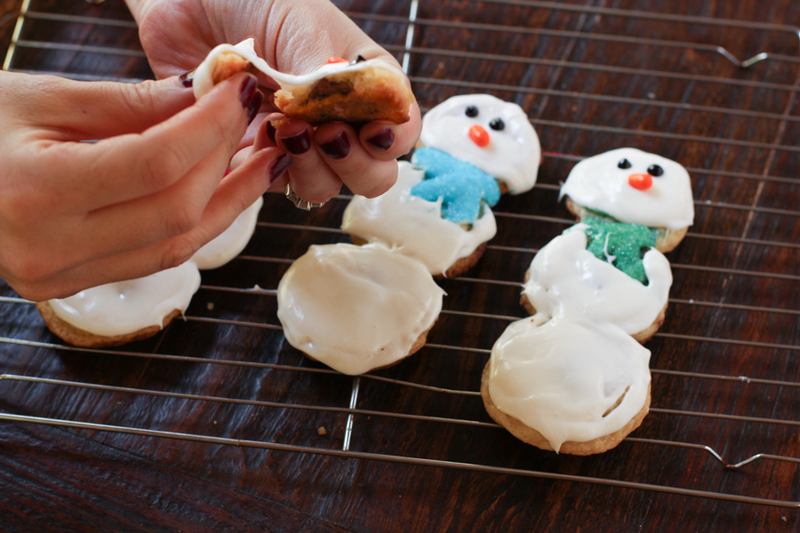 Gently tap the snowman to remove the excess sprinkles. Then, pipe frosting around the edges of the cookie. Microwave a few heaping spoonfuls of frosting in a microwave-safe bowl at 50% power for about 30 seconds. Drizzle that over each snowman to fill in the rest of his body. Give your snowman eyes with black decorating gel and an orange candy nose. MMMM… now we get to the best part. Dig in! 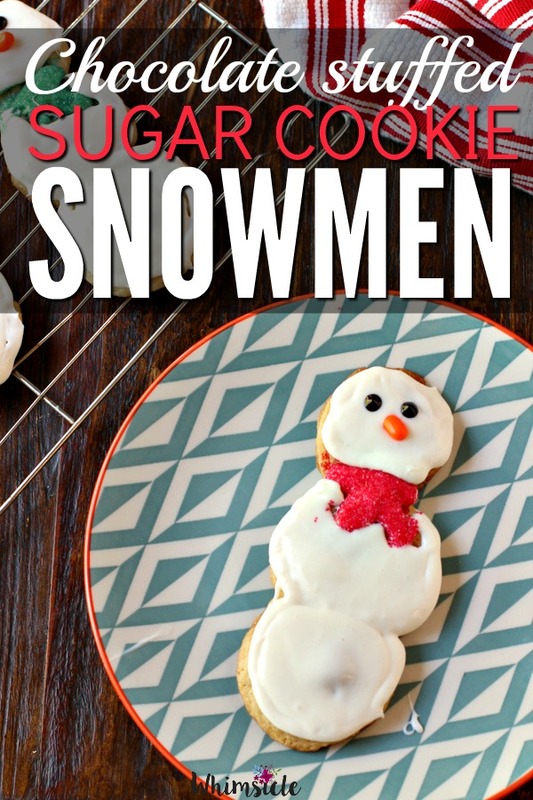 These snowmen are a great holiday baking activity for your kiddos and would make awesome neighbor gifts. 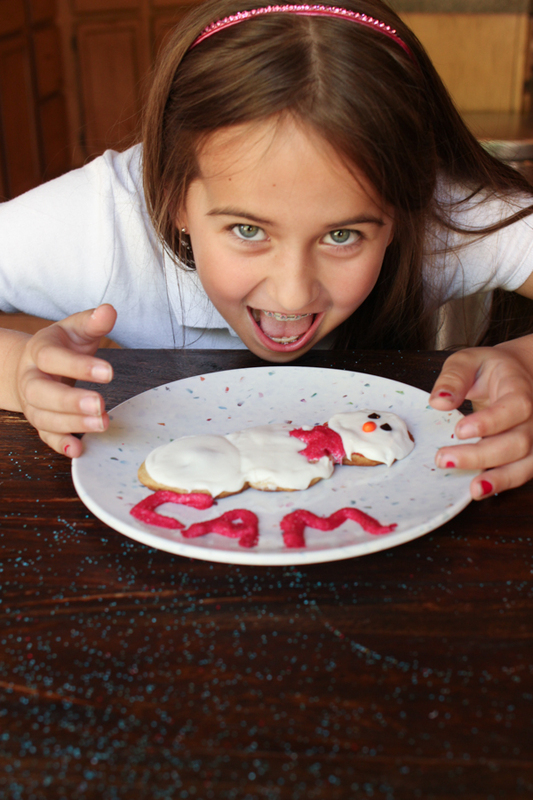 I surprised my kids after school by piping their names onto plates and dusting with the colored sugar. You can say they were pretty stoked. 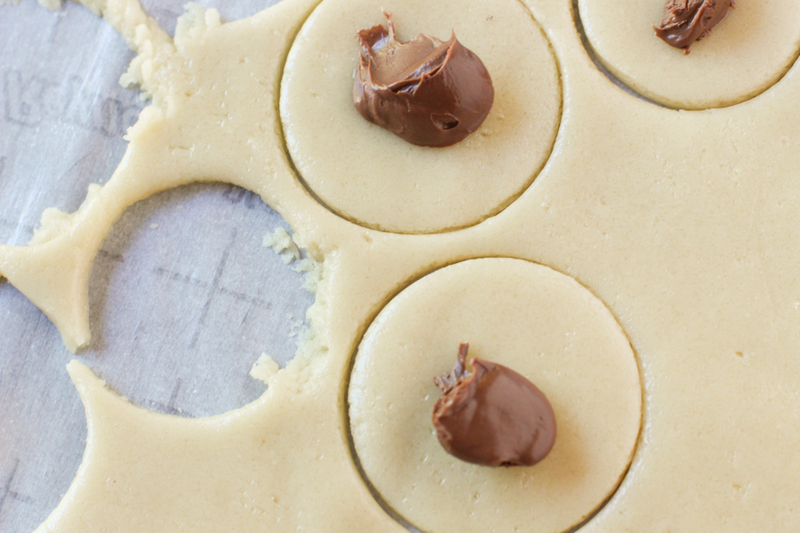 Because everyone needs a few more cookies with rich, chocolate centers, right? 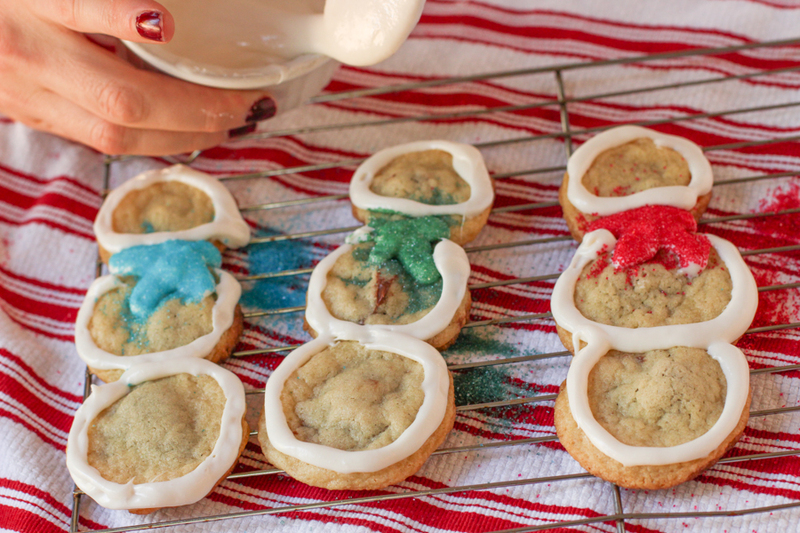 This is such a creative way to use sugar cookie dough. My kids would flip for these cookies, and the best part for them is actually getting 3 cookies at a time! The best part for me? 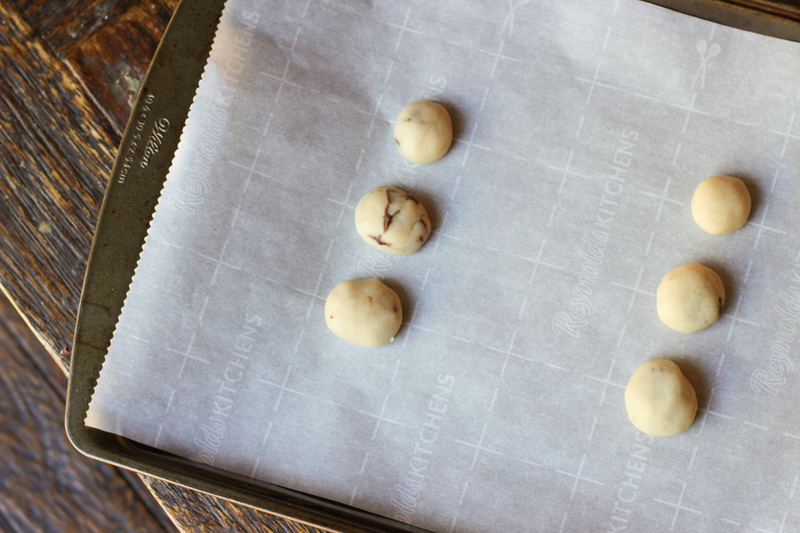 Using prepared cookie dough – I need all the shortcuts I can get this time of year. Thanks so much for sharing. And we all love 3 cookies at a time!! !